Scamander, East Coast Tasmania. Our safari tents are fully self-contained and offer all the comforts of home with the added benefit of feeling like you're in the great outdoors. Guest tell us that they love the feeling of sleeping under canvas, listening to the sound of the waves lap at the beach and the breeze in the trees, waking up with all of the conveniences of luxury self-contained cabin accommodation, with the added benefit of feeling like you're in the great outdoors. 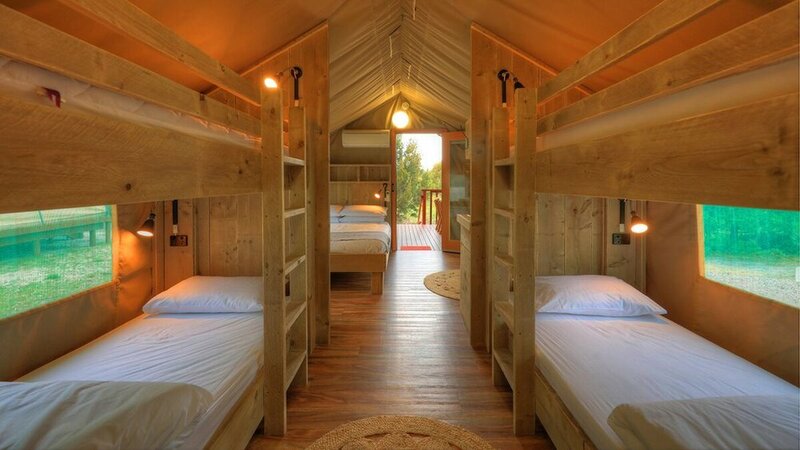 We offer family safari tents that can sleep up to six people on two sets of bunks and a queen sized bed. We also offer couples safari tents with a queen sized bed and couch that can be made up into a bed if you are traveling with a child or extra adult. Read about what to pack for a safari cabin stay. Every safari tent has a reverse cycle air conditioner and a television for guests' enjoyment. All our safari cabins contain private bathrooms so you can enjoy your privacy. A communal park laundry features large commercial sized coin-operated washing machines and dryers as well as two washing lines outdoors. BYO washing powder or purchase some from the office for $2 a load. And please BYO washing line if you require undercover use at your safari cabin.